After my father died, I set myself the goal of reading all the books he’s sent me before this year ends. I started with this biography of E.B. White. I wanted so much to share my thoughts on the book with my father, so I did what I would have done if he were still alive: I wrote him a letter, which I am excited to share with you now. Sims’ style is breezy and rich like good travel writing—he clearly has tried to inhabit White and bring him back to life. He is an unabashed fan and doesn’t hide behind the mask of professional distance, doesn’t force himself to be critical just for the sake of seeming “fair and balanced” or “provocative.” I imagine Elwyn Brooks White growing up in a Vincent Minelli version of Mount Vernon full of sledding hills in winter and lush lawns and carriages in summer. 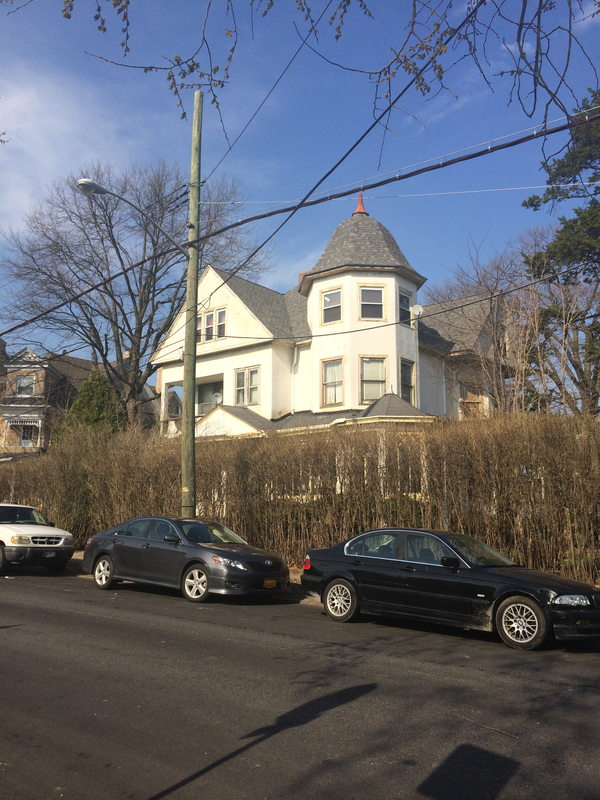 There used to be a vaudeville theater on Gramatan Avenue! Was it next to Maggie Spilane’s? Or on what’s now the “dodgy” end, past the roundabout with the fountain where rundown barbershop polls are frozen next to delis selling lotto tickets and greasy kabobs? You’d think I would have seen a decayed facade… I did see Lincoln Elementary School, probably on the same grounds where Elwyn went to school in the 1910s—one hundred years ago!—but now as a sterilized 1970s brown brick building. Equally engaging was Sims’ account of young Elwyn—redubbed Andy by his Cornell frat buddies after a beloved college founder, Andy White (no relation)— entering the literary world. Andy’s first publications were poems and essays of a nature-writing variety sent to the children’s magazine Saint Nicholas. In my History of Reading and Readers class at library school, one of my classmates researched the publication history of Saint Nicholas, the first American magazine for and by children. I felt a twinge of proud librarian expertise at the recognition of the name. (I did learn something at my fancy school.) Sims documents with a historian’s precision but a fan’s devotion the literary culture of New York in the 1920s, detailing the newspapers, satirical rags, and high literary magazines that populated the newsstands in Grand Central station during that golden age of American print. He imagines–apocryphally, but who cares?–Andy picking up the first issue of The New Yorker at the news kiosk next to Grand Central’s globe clock with early morning light streaming in from the high, rounded cathedral windows. Having seen the streaks of light across the marble floors, I could fill in rest: the wooden benches (all removed now to discourage the homeless) that once filled the hall, the train schedules (that still exist) flipping over with mechanical clacking like clockwork dominoes, the newsboys in caps and knickers, the ladies in cloche hats carrying portmanteaux or parasols. And Andy, who was too skinny to be drafted in World War I, delighting in this cheeky new upstart magazine, The New Yorker, and deciding—to hell with his advertising job!—he would submit something. The descriptions of New York bustle, which Sims recreates from historical research and copious close readings of Andy White’s regular “Comments” columns from years of New Yorkers, drew me further into his story. Again, I saw yesterday’s New York waving behind today’s. Yet Andy White himself regularly sought refuge from the city, eventually moving to a farm in Maine, near where he’d vacationed as a boy. This farm and his childhood barn and love for animals of all kinds, particularly birds, cows, and dogs, spawned Charlotte’s Web. That’s the contention of Michael Sims who quite convincingly uncovers references to animals—especially spiders—in Andy’s early writings dating to childhood and his New Yorker days. It’s the animal-lover side of E.B. White that I identify with least. As much as I can appreciate natural beauty when confronted with it and enjoy anthropomorphism in literature, I don’t feel the same connection with animals that lead E.B. White to spend a year researching the life and death of barn spiders. Nor can I easily put aside my disgust and enmity for the mouse that seems to be living in our stove when I read about young Elwyn taming a mouse who used to visit his childhood bedroom in Mount Vernon, eventually inspiring Stuart Little. The brilliance of Charlotte’s Web and White’s writing is that he made Wilbur, Charlotte, Templeton and farm life real for children all over the world. Reading Charlotte’s Web at age 6 or 7, I did learn–at least morally– to respect and empathize with spiders and pigs. Recently, my librarian friend Angie’s 9-year-old son explained to me that he has decided to be a vegetarian because of Wilbur. As I wrote two years ago upon seeing the real toys that inspired Winnie the Pooh at the New York Public Library, the literature of childhood resonates with people in a visceral way that is hard to describe and analyze. That makes Sims’ biography all the more impressive to me. He captures the frenzy, excitement, and setbacks of the writing and editing process, and he includes reproductions of White’s manuscripts. As the chapters get closer to the publication and success of Charlotte’s Web, the reader experiences emotional reactions of recognition—“Aha, finally, this is the part I know!”—and revelation—“I didn’t know that! So that’s how it happened.” When influential New York Public Library children’s librarian Anne Carroll Moore panned Charlotte’s Web as she had panned Stuart Little, I felt professional shame on behalf of all librarians! I finished the E.B. White biography alongside a visit to the Morgan Library’s exhibit of manuscripts and draft drawings from The Little Prince, which Antoine de Saint-Exupéry wrote in 1942 as an expat in New York. I was struck by how similar both men were in their writing processes and beliefs about how to write for children, yet how different their personalities seemed to be. Saint-Exupéry was a daredevil who felt restless in Manhattan and wrote the French military for special permission to reenlist as a pilot in North Africa. Just as his novel was taking off, he disappeared during a solo recon mission over the Sahara dessert in 1944 at age 44. By contrast, E.B. White suffered from hay fever and sinus problems throughout his life and went through periods of chronic and possibly psychosomatic illnesses, yet he lived into his 80s and died at home in Maine in 1986. Saint-Exupéry never fully mastered English but was part of the French expat community in New York, which eventually lead him to meet the wives of two American publishers, Reynal & Hitchcock, who ended up publishing Le Petit Prince, first in French then a few months later in English, here in New York. It wasn’t until 1945 that the novel was reprinted and more widely distributed by a French publisher, Gallimard, in France. By then, Saint-Exupéry was already missing over the Sahara, leaving only his ID bracelet and some plane parts behind. This broken bracelet sat in a display box at the Morgan Library, making me wonder if Antoine had in fact evaporated like his Little Prince and traveled back to his home planet. The two authors never met, although they could have, in theory. Surely E.B. White was summering in Maine in 1942-43 while Saint-Exupéry was busy sketching elephants inside boa constrictors in a rented house on Long Island. Michael Sims’ biography mentions that E.B. White’s wife, Katherine Angell White, a long time fiction editor for The New Yorker, where they met, reviewed The Little Prince for the magazine. In her brief review of the novel, Katherine quoted their young son, Joe White, as saying somewhat critically that: “The author seems to be writing about grownup things in a childish way.” In contrast, E.B. White seems to write about childhood in a grownup way. He peppers Charlotte’s Web with sly vocabulary lessons; Charlotte is always defining words for Wilbur including: aeronaut, humble, salutations, and her last name, taken from the genus and species of her type of barn spider: Charlotte Aranea Cavatica. Yet, to me, there seem to be more stylistic similarities than differences between Charlotte’s Web and Le Petit Prince. Neither book shies away from death or making larger points about life and morality; both are deeper than most children’s books appear. Both books were whittled down expertly, mostly by the author-as-editor, to their essence. According to the Morgan Library exhibit, Sainte-Expuéry’s first manuscripts were nearly double the word count of his final draft. White struck out entire passages and scenes, reworking Charlotte’s Web for a couple years before sharing it with his editor. P.S. According to Sims, , E.B. White borrowed the final line of Charlotte’s Web from his wife Katherine: “It’s not often someone comes along that’s a true friend and a good writer. Charlotte was both.” Katherine publicly defended her husband’s essay-writing against a scathing New York Times critic, writing in her reply: “They [the critic’s words] are not words that should be applied to anyone who is an honest man and an honest writer. Andy is both.” How small his change of “honest man” to “true friend,” yet how it makes all the difference! I’ve had a strange feeling all day since learning that Maurice Sendak died this morning. There are many odes to him on the internet and in the traditional press too, not the least interesting of which is his 2 part interview with Colbert from a couple months ago. But the best one I’ve found was actually an illustrated conversation he had with…who else?… Art Speigelman. Cartoon Spiegelman and Cartoon Sendak are walking through the woods, which of course are pages from Sendak’s books. Sendak has just published “We Are All In the Dumps With Jack and Guy,” a book that we own and that I found fascinating and disturbing as a child, but probably not as disturbing as I would find it now. It was not as beloved as “Where the Wild Things Are” or “Mickey In the Night Kitchen” nor as visceral a sense-memory as “Outside Over There,” but I do remember a page where Jack and Guy are running through the rye. And when I read “Catcher In the Rye” years later, that’s what I imagined that Holden Caulfield was imagining, catching kids in the rye. To love something so much that you need to eat it, to gobble it up so that it can be part of you, is an idea so perfect (and bizarre and possibly Freudian) that it lives in the land of the Wild Things and the land of Over There. And who wouldn’t want to eat Mickey’s cookie airplane as it crumbles in the milk? I felt so strange upon hearing this news today– a sad but sisterly nostalgia to the delight of meeting the real Winnie the Pooh— that it can only mean one thing: that I had eaten Sendak’s books so long ago, in that Wild Thing state of childhood, that they were a part of me. And I suddenly remembered sitting in a musty library in Clinton, New York. That tiny library with the creaky floors in the children section. I was sitting on one of those stools for reaching higher books. We have the same stools at my library now, in fact. And I was reading about Ida with her trumpet, saving her baby brother (or maybe sister) from the Goblins. And there was no difference between me and Ida. I don’t even know if I knew how to read yet, and I assume my dad must have read me this story before, but I was Ida, and I was brave and also scared of the goblins who replaced the baby with a changeling. And maybe, in that moment, after living so briefly and so vividly in this book, I became a big sister. Even if my little brother was not yet born or was just a baby. Whatever acuity or judgement I turn towards him, I will also hold up my trumpet, take back my evil wish, and save him from the goblins. And my brother knows that, I think, even though we are no longer children. As fascinated as I was by Malcolm X’s Koran, Charlotte Brontë’s travel writing desk, an early draft of the Declaration of Independence, and Charles Dickens’ letter opener, and Virginia Woolf’s cane, one curiosity–or family of curiosities– caught me by surprise and left me unexpectedly amazed and aglow. There was a children’s area of the New York Public Library’s 100 Years exhibit that included large prints from The Wonderful Wizard of Oz, playing cards and comic strips. In the middle of this section was a display case with some very worn stuffed animals from the early 20th century. I didn’t have to get too close before I recognized them. It was Winnie the Pooh with his friends Tigger, Kanga, Piglet and Eeyore. Not the Disney-fied Pooh Bear with his monstrous red tee-shirt or the retro-Pooh made in a softer tan and modeled after the illustrations in Milne’s classic. The real Winnie the Pooh that belonged to Christopher Robin. The Library acquired the stuffed animals in the 1940s after a wealthy New Yorker who’d bought them at auction donated them to the Library. Winnie looks like a Teddy Roosevelt teddy bear. Piglet is impossibly small. Kanga has a lovely pouch and a slightly crooked neck. Tigger’s stripes are still plainly visible after all the years but he looks more like a cat than the blaze-orange, slinky-tailed buffoon of the Disney film. Eeyore is patched with drooping head and–sure enough– a little nail holding his tail on. I think one of the Pooh video cassettes we had when I was a kid had some footage of the original toys, because they looked familiar to me. But it wasn’t just the video, which I must have watched over 20 years ago and, truth be told, was not one of my favorites. I believe these particular stuffed animals felt so familiar to me because it was clear they had been loved and played with (this is the key to the existential merit of a toy, according to the philosophy of Toy Story 3), and in a way, anyone who has read the books has played with them. My mother would call this a “Proustian moment” but the petite madeleine I bit into did not open up a locked-away memory so much as kindle a childlike excitement, a sense of recognition, a kinship with these toys. Children visiting the Library exhibit took interest in this display but with more puzzlement and curiosity than elation. The stuffed animals are so old that some of the kids didn’t immediately understand that they were toys, let alone whose toys they were. I’m sure the Disney images have altered kids’ vision of what Pooh looks like as well. But I was struck by the reverence that parents and older visitors passing by gave to Winnie the Pooh. In this exhibition were manuscripts from the 1300s, published letters from Christopher Columbus, and a draft of the Declaration of Independence (in which Jefferson condemns slavery–but that part was stricken to appease the Southern Colonies). There was a Gutenberg Bible and a handwritten Beethoven sonata. But of all these amazing manuscripts and objects, Winnie the Pooh, little Piglet and the others seemed to be the most fascinating and evocative to people, provoking physical reactions of glee. Nostalgia plays a part, I’m sure, but I don’t think the way Pooh was commercialized or the pop culture aspect of the Pooh stories (as opposed to classic literature like Brontë, Dickens, Woolf, Borges, etc) are responsible for the tenderness onlookers felt when seeing the inspiration for these fictional characters. I don’t think their appeal lies in pop art or nostalgia. Rather, these stuffed animals embody the creative process and what literature can be more tangibly than a writer’s personal journal or scribbled notes. A.A. Milne took inspiration from a bear that his son played with. He gave that bear a personality, a name, and a story. He gave the bear life in the imagination. Now the bear has outlived the boy. In “Bird by Bird” Anne Lamott describes writing fiction as ‘listening to the dolls talking.” I think that’s what Milne did. He listened to what the bear had to say to the donkey. He let them talk. If not for this process–for writing– Pooh would just be any other bear. But now, he’s the most famous teddy bear in the world. So much so, in fact, that people visiting the New York Public Library of all ages recognize him and smile as if they’d just found something from their childhood in the attic. So many of the pieces in the exhibit take the viewer back in time– decades and centuries ago–but Christopher Robin’s stuffed animals take us back further, to childhood and to the beginning of what it meant to read. letter opener in New York. the claw of his favorite cat. I took Victorian Literature with my favorite English professor in college. We read the Brontës, Thackary and Dickens. One thing I loved about Professor John Olmsted was how he told stories. This was an “old fashioned” class. We sat in a room in a building shaped like a radiator, read poems or novels, and discussed them. Our discussions could be fierce, timid, or eye-opening. But they were usually prefaced or interrupted by snippets of history and literature that guided us in a more interesting if not necessarily more scholarly or more “correct” direction. He knew perhaps that most students would be willing to wrestle with “Jane Eyre” or “David Copperfield” but probably not a full biography of Charles Dickens or Charlotte Brontë, and so he spent part of each class dispensing biographical stories. In high school, we would have called these stories “tangents” and my classmates would have strategically attempted to delay a test or unpleasant assignment by saying a buzzword (for one of my history teachers it was “Ronald Reagan” but for a math teacher it was “Ireland”) that would derail the class from our programmed work. Not so in college. I was lucky enough to go to a college where tangents were neither irrelevant nor used as a tool for classroom insubordination. Olmsted’s tangents were like those lengthy footnotes that you often are inclined to skip, but once you’ve read it have a hard time forgetting. He would recount stories about Dickens not as if he knew the man well but as if he had visited with him for a while. As a consequence, while humanizing the authors, he gave us enough context to keep us from sounding like complete anachronistic idiots when analyzing a particular chapter or theme. I was always impressed with how much Professor Olmsted must have read to learn these things, and yet he respected and made use of an oral storytelling tradition to bring a past world to life. We read literary criticism and other articles, but those authors and hypotheses don’t stick with me. What I do remember is that Dickens had too many children, lived paycheck to paycheck and was in debt at times, was a celebrity in his lifetime, and had such a large amount of correspondence in addition to his serial- and novel-writing that he spent hours each morning answering letters. He would have several going at a time, writing a line here, finishing a sentence there, just like Monet with a row of canvases. In hindsight, I feel Professor Olmsted must have told us about Bob (“Never was there a finer cat”) and possibly even the letter opener. But maybe that’s a conflated memory. 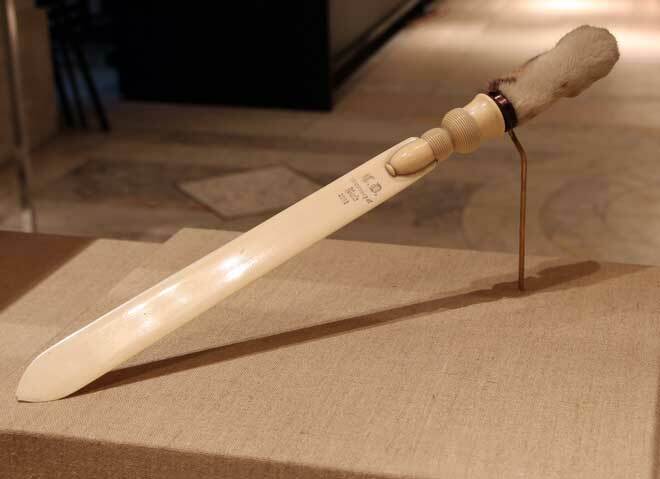 I was so viscerally appalled and intrigued upon visiting the ivory letter opener with poor Bob’s paw on the handle at the New York Public Library’s centennial exhibit, that my reaction could not have been presaged. And yet, now that I’ve accepted the existence of this improbable object, it seems like something I had heard of before. Something just to the left of unbelievable. I don’t know whether this letter opener– resembling an off-white machete — makes Charles Dickens seem more of a man or more of a monster to my 21st century eyes. But I could see Dickens wielding the instrument in a creaky Victorian house with the soot and smoke of London coming in the morning-streaked windows. I could see him slicing seals and envelops with relish, then heaving a little sigh for his poor dead Bob. He would dip his quill and sign the first letter of the day. I took Victorian Literature the semester before I went to study abroad in Europe. When I visited London, I remember standing on the Millennium Bridge midway across the Thames, looking back at Saint Paul’s Cathedral and ahead towards the South Bank where the Globe Theater awaited us, decked out for Shakespeare’s birthday on April 24th. I saw the soot marks winding up Saint Paul’s Cathedral like rings on a sequoia, and I thought of sitting in class a couple months before and listening to Olmsted tell us how the smokestacks in London on the south bank of the Thames were dangerously low during Dickensian times because nothing was allowed to be built taller than Saint Paul’s. As a consequence, black soot wafted over the river, coating the city in pollution and dirt, defacing the whiteness of the Cathedral. The Tate Modern on the South Bank stood in for these Dickensian coal factories on the skyline in my mind. London had recently undergone a cleaning and restoration project. They weren’t quite done with Saint Paul’s, whose columns looked like a graying, dirtied version of the Washington D.C. capitol building. And standing there in the middle of the steel-colored river, it dawned on me that a lot of the soot still on that cathedral had been around since Charles Dickens was alive. It was a long bridge, and these were short thoughts, but now, as a librarian and a traveler, I am realizing that Olmsted’s stories came as much from his travel as from reading. There are many ways to cross a new bridge, and even more ways to cross an older one.